You are here: Home / Family / Stroller Strides Mother’s Day Celebration! Stroller Strides Mother’s Day Celebration! 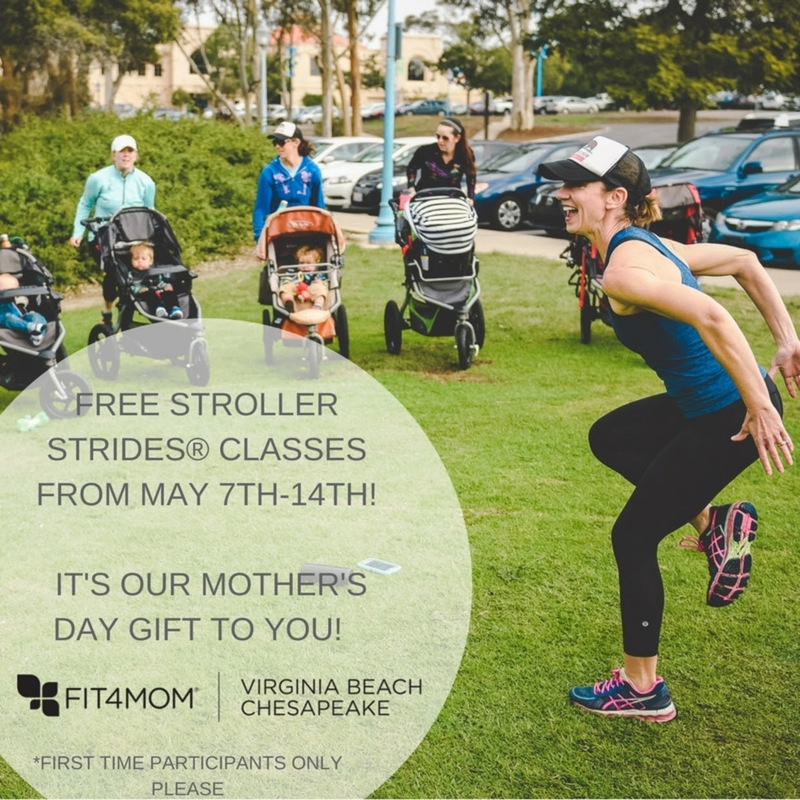 This week, May 7-14, 2018, Fit4Mom Virginia Beach and Chesapeake will be offering FREE Stroller Strides exercise classes. You can always try your first class for free with Stroller Strides, but this week you can attend a class each day for 6 days absolutely FREE! That’s a great deal! Stroller Strides is a workout class where you bring the children along and exercise while they’re right with you, safely strapped in to their strollers. Bring some water, and your little ones and you’re ready to get started! Feel free to bring a yoga mat and resistance bands if you have them as well. Classes are held near playgrounds so the kids can play after class. Two birds, one stone! The big Mother’s Day celebration class is Monday, May 14th. There will be prizes and lots of fun. Use the link below to RSVP and save your spot! Stroller Strides Annual Mother’s Day Celebration! RSVP HERE TO RESERVE YOUR SPOT – Use this link to register for your free week leading up to the event. Mark your calendars! Our annual Mother’s Day celebration is on Monday May, 14th. This event is all about YOU! TWO- locations to choose from – Mount Trashmore Park & Chesapeake City Park at 9:30am. We’ll kick off our celebration with a Stroller Strides workout class. First time participants can attend FREE Stroller Strides classes from May 7th – 14th, it’s our Mother’s Day gift to you! After, all class participants will get a chance to win some AMAZING giveaways & have a “mommy and me” picture-taking by a photographer for free! CHECK OUT OUR SPONSORS AND THE WONDERFUL PRIZES THEY HAVE DONATED HERE. Let them know Mom Explores Virginia Beach sent you! Hope to see you there!